The Holton Crest rotary extrusion machines are uncompromising in design and build, constructed to be superior in quality, performance and reliability. As specialists in Continuous Rotary Extrusion, our powerful and adaptable extruders have been designed and built on years of experience to deliver optimum production rates. Our depth of knowledge and focus on the extrusion process, combined with the very latest technology ensures precise tooling control and a superior extruded product every time. 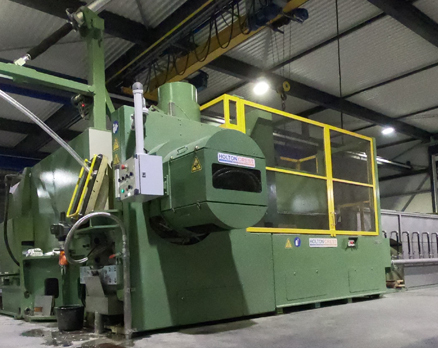 The Holton Crest HC1100 Rotary Extrusion machine is specifically designed around the CRE process, with the latest dual axis machine including the very latest technology and digital control systems, enabling precision control measures at all times. With a maximum production rate of 1,100 kg per hour (for copper processing) and the capacity to manage feed material from 9.5 to 19mm diameter, the HC1100 is ideal for small section products or a small volume producer, designed around the individual requirements of our customers. 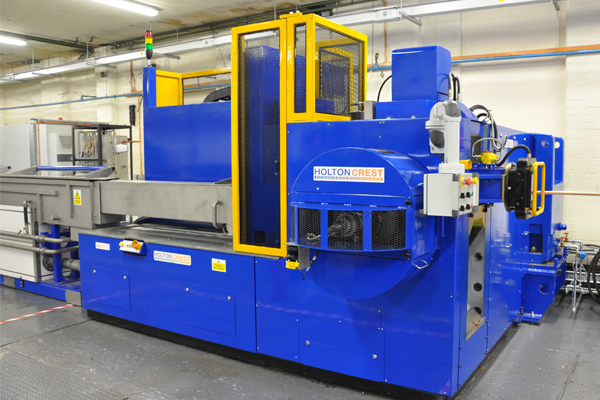 The Holton Crest HC2200 Rotary Extrusion machine is our mid-range machine designed for high pressure extrusions. Ideal for high pressure and high precision copper aluminium profiles and tubes, the HC2200 includes the very latest technology and digital control systems, enabling precision control measures at all times. With a maximum production rate of 2,200 kg per hour (for copper processing) and the capacity to manage feed material from 12 to 25mm diameter, the HC2200 is ideal for a variety of products on a mid-range volume production line, designed around the individual requirements of our customers. 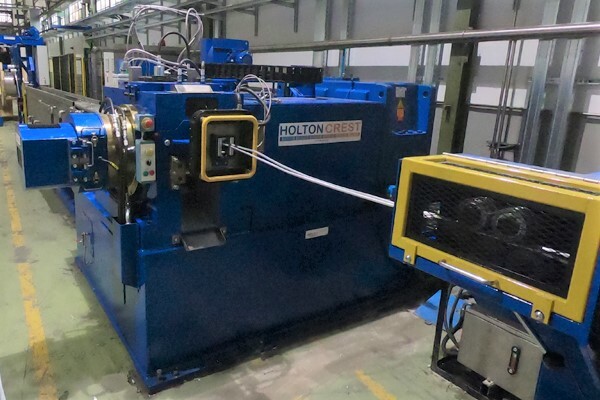 With a maximum production rate of 4,000 kg per hour (for copper processing) and the capacity to manage feed material from 19 to 32mm diameter, the Holton Crest HC4000 is our flagship extruder with high output of high precision products, designed around the individual requirements of our customers. The HC4000 is ideal for cut to length add-on, but has also recently been installed with a single input, dual wire output that utilises our full speed auto changeover twin coiler. With the HC4000, you can match extreme load carrying capacity with high production rates. All Holton Crest machines are specifically designed around the Continuous Rotary Extrusion process to deliver high performance and optimum production output with a superior quality extruded product at all times. 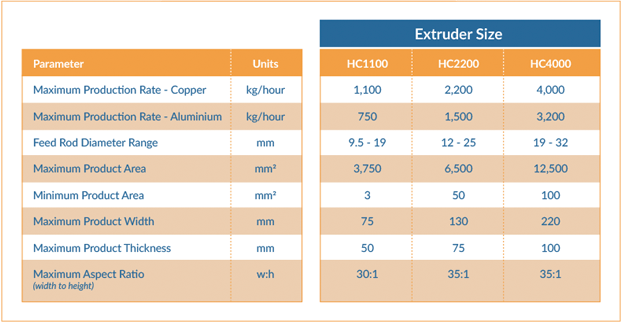 The following table highlights the performance data of the 3 current Holton extruders. All figures are genuine and proven performance statistics and highlight the high performance nature of our equipment. Please click on the table to download a PDF version.